Graphene is so yesterday. This decade’s material-of-the-century are the tellurides. 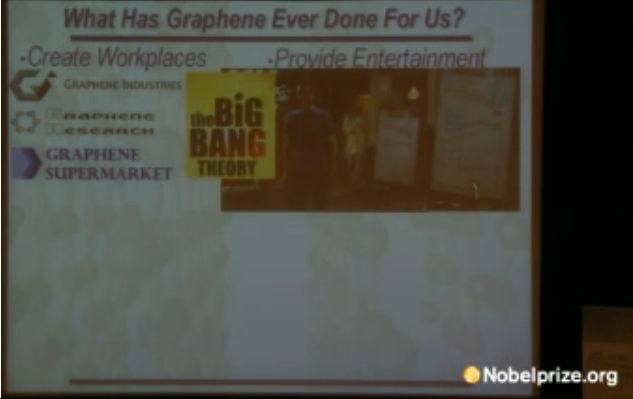 At his official 2010 Nobel Prize acceptance lecture in Stockholm, Dr. Novoselov shows graphene, and Sheldon. In his lecture, Sheldon told his class (and about 15 million onlookers) about the strange behavior seen recently in certain compounds of bismuth, tellurium and tin. These strange new substances are insulators conductors insulators insulators and conductors simultaneously. These tellurides and their cousins are part of a new class of recently discovered materials called, as Sheldon said, topological insulators. In materials such as typical plastics, electrons are pinned to the underlying structure and don’t move. Because they can be used to keep conductors from shorting out, they are called insulators. Relative to the best conductors, the electrical conductivity of the best insulators is 1026 smaller, that’s a factor of 10,000,0000,000,000,000,000,000,000. Few quantities in physics vary by so much. On the whiteboards tonight, viewers saw bismuth telluride, cadmium telluride, and mercury telluride making cameo appearances. In these materials, the bulk volume is insulating–while the surfaces conduct. At the same time. How can that be? Some clever wag may point out we could do this by just electroplating some plastic. That was one of Richard Feynman’s first jobs and would be conductive on the outside but insulating in the middle. But the difference here is that would be two materials. Physicists never imagined this could be done with a single material at once. The key difference from normal insulators is the reason they are called “topological”. The description stems from the branch of mathematics called topology that characterizes the fundamental shapes of objects. You can stretch a doughnut to form a coffee cup (one hole), but cannot make it into an object with two holes. In the same way, the underlying structure of electron orbitals in an ordinary insulator can be represented by a simple loop. 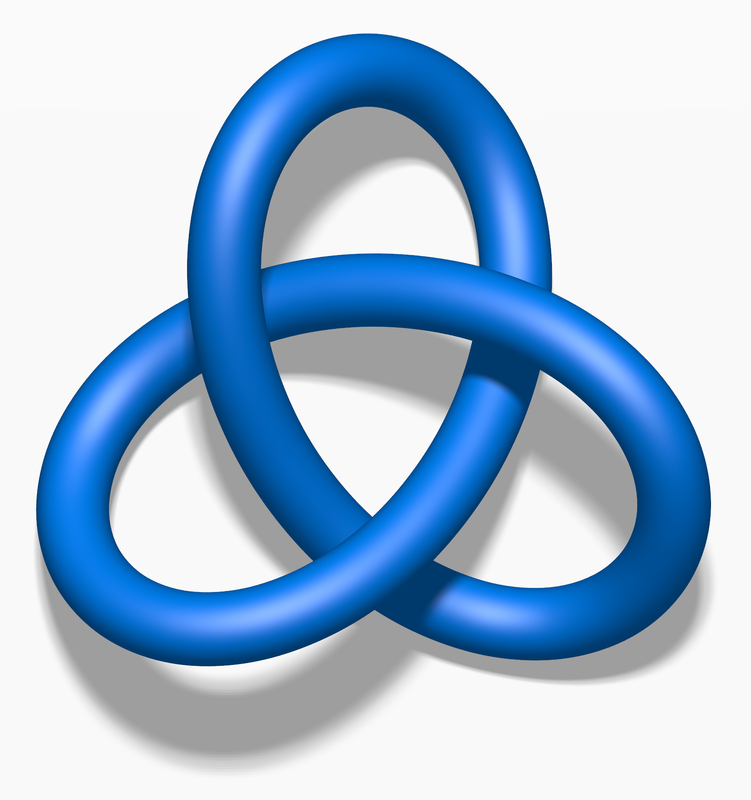 A loop topologically distinct from the simplest possible knot: a trefoil knot. The structure of electron orbits in topological insulators are akin to the trefoil knot. It turns out the interactions of the electrons’ spin with their orbital angular momentum creates a mathematical structure described by the trefoil knot. For reasons beyond the ability of your science consultant to understand, the difference becomes apparent on the surface of the material: becoming metallic and conductive for the topological insulators but remaining non-conductive for normal insulators. If you have a good explanation, please leave a comment. Such effects have been seen before, but only with difficult-to-create flat structures. But now, just like Hollywood, physicists have gone 3D with the advent bismuth telluride. Topological insulators can be created with standard semiconductor fabrication technology. The simultaneous insulating and conducting nature of the topological insulators is not an effect that can only be produced in expensive labs with high vacuums or extreme cooling. These materials behave this way even at room temperature on the lab bench, or even held in your hand. Work has heated up over the last five years and many other compounds have been found to display not only the dual properties of topological insulators, crystals made of bismuth, selenium and copper have been made superconducting,moving electrons with no dissipation at all. Topological insulators hold promise for new types of computing and materials whose applications we have not even thought of yet. Their behavior is interesting in and of itself to physicists. Sad to say, some popular articles have fallen prey yet again to the monopole falacy. This is the same annoying error that Sheldon complained about to Ira Flatow on NPR’s Science Friday. Now in this latest article (and others) it says one of the interesting features of topological insulators is to make quasi-particle versions of axions, analogues of what are being sought in elementary particle physics. However, just as with the magnetic monopole claims, that article misses the point completely: Particle physicists don’t look for new particles just to see their mathematical behavior. We look for them because their existence means something about the Universe. In the case of the axion, it would validate certain explanations about why deep symmetries exist in nature. Axions could even be the dark matter in the galaxy. But an axion-like-thing observed in a condensed matter system is not an axion. It has none of that meaning. Materials are topological insulators are still interesting in their own right. Such popular articles mislead readers at a deep level and do a disservice to these new materials by compromising the description of why they actually are interesting. This entry was posted on February 3, 2011 at 5:30 pm and is filed under Uncategorized. You can follow any responses to this entry through the RSS 2.0 feed. Both comments and pings are currently closed. It’s not an r, it’s a sloppy n.
With a muffled sigh, the math teacher walked into his classroom. A godforsaken night class. It was the last of the math classes required by the students. The book used was colorful but lacking, and the teacher’s solution manual was found after 1 quick google search. What he’d give for a 2000 page black and white tome! The department, however, was firm: this was the book we use. He had managed a small rebellion: every homework due included at least 1 question that couldn’t be solved by a computer, and sometimes required checking another, more serious book to even understand. He eyed his classroom. Just around 60 students. Enough to get a TA to correct the assignments. A small balm, at least. He could spend more time with his research… wherein he was hopelessly stuck. He sighed audibly this time. As usual, the rowdy bunch at the back was chatting away. “Those students! Having fun…” he tried to ignore the small wiggle of jealousy. The other half were busily clicking away on phones they didn’t bother to hide. A speech was boiling within him: “You’re paying 300$ to be here. The government pays another 300$ in grants. All so you can spend time with someone who’s worked his entire life on the question of “What is an area?” and “How do you fill it?” My published research list is longer than your arm! I’ve even submitted a paper on the probalisitc origin of thought! Sure, I’m no Penrose… but no one laughed either…” No, he thought, they just look bored. His mouth set in a grim line and he opened the cursed book. A chunky mishmash of solved examples and theory stared at him. His eyes strayed to the many colourful graphs in it and he smiled as he recognized one: cos(2a). “I always liked cos() more than sin(). It just seems… friendlier.” The classroom stared at him. He carefully began tracing the curve on the blackboard, carefully following the counter clockwise direction. It looked like a 4-leaf flower. The white flower rested on the blackboard. He picked another equation. It gave an impair equation with bounds from -1 to 1. Its area came out to 0 unless separated into two. Computers couldn’t do it. “Does anybody want to solve this one?” He stared out into the room. “Should I start calling out names?” He began ruffling through the mass of assignments on his desk. The black lead on the white paper roared back at him, hungry for red ink. He dropped the pile and his gaze returned to his flower. “Who wants to solve it?” His voice was calm again, but more remote. A tentative hand went up. “Please, come down.” A big, broad shouldered student walked down, his big steps showing nervousness. The teacher smiled kindly and waved a hand at the board. The student wrote in big, round letters. “Ah, no. You need a three there.” A mumbled “right, right…” and the thing was finished and the student returned. He picked another equation, and solved it himself. He picked again, and asked for another volunteer. A girl from the 1st row, her waist length, straight black hair covering her face, walked down and, while holding the chalk like paintbrush, simplified it using a trigonomic identity before solving it. He picked another. This one needed focus, as the bounds ended up creating 8 terms at the end. “Who would like to solve it?” A hand in the back went up…. and down. He looked to the other side. The hand waved up and down a few more times. He tried not to look at the upholder. “Anyone?” but the hand stayed up. Beneath it, a large mass of unkempt hair, and beneath that, two wild, lantern like eyes peered back. The Teacher hesitated. On one hand, the assignments that hand had done were quite good, but on the other… they hadn’t been stapled! So he’d placed a paperclip on it… and had it returned the next week. On another assignment! It was his, he could see it and hold it but he couldn’t take it without sowing disorder. And the bright orange flannel scarf with a green striated hat weren’t helping matters either. But it was only a paperclip! “And class is ending soon…” and with the worried but beneficent smile of Dr. Frankenstein watching his creation amble towards the sleeping village, he waved the creature down. Like a monkey from 2001 a Space Odyssey, it peered up at the blackboard. The Teacher began a helpful line of “So you need to…” It started to draw the space the equation was in, a triangle in the xy-plane. “Now you want to do from one end to the other…” It found the position of the tip of the triangle. It began to haltingly mumble something about Riemann sums, and how important the connection between geometry and numbers is. “The field’s the thing, and the answer is the calculation,” it chanted. Then it began calculating, occasionally smudging numbers that were badly drawn, which further obscured them. Then it summed everything and wrote the answer out in decimal. Which elicited an outraged grimace from the math Teacher! If you have a magnetooptical trefoil knot, interrogation with linearly polarized light will rotate the polarization plane. Trefoil knots are chiral, linearly polarized light is racemic. Next stop – surface chiral micropatterning. Maybe one of you guys will think of it second. Physics can ab initio derive an aspirin, chemistry can empirically cure a headache. Thanks to Big Bang Theory and Sheldon, I once had talked about Graphene in a seminar and was appreciated very much! The observation of a conductive surface state is not the interesting thing about the recent topological insulators. These have already been known to exist — for example, some of the surface states of pure silicon are conductive. Rather, it is the topological invariance of the Dirac Fermions (a concept that I still do not completely understand) in a more accessible experimental system that is the interesting feature of the latest materials. First, I am *so* not a physicist. In fact, basic algebra challenges me in ways I am loathe to admit. That said, every once in a while I read something that causes an idea to spring into my mind. Most often, my complete lack of understanding of the topic at hand renders my ideas ridiculous on their faces. But, being who I am, that never stops me from asking question that might look stupid to the better informed, but make perfect sense to me. My question: Could the apparent dual nature of the topological insulators be somehow analogous to surface tension in water? And, if so, would such an anology be helpful in understanding the properties of these topological insulators? The quantum Hall effect is also an example of topological insulation in a 2-d system – in the bulk the charge carriers are trapped in closed loops (Laudau levels, the quantum analogue of cyclotron orbits) but at the edges of the sample the loops are disrupted (a charge carrier which encounters the edge of the sample will scatter from it and this breaks the loop) so you end up with a 1-d conductive state going around the edge of the sample.